Is Protein Before Bed a Good Choice? 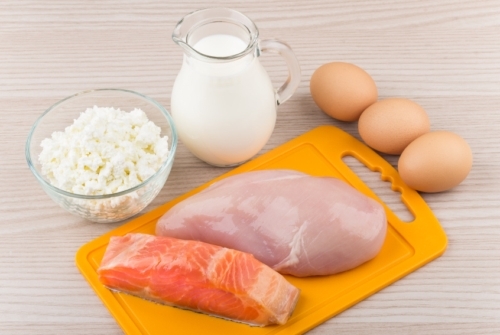 Home » General Health » Is Protein Before Bed a Good Choice? Eating protein before bed is a good idea to develop muscle, according to a new study published in the Journal of Nutrition. The researchers tested the hypothesis that muscle protein synthesis is raised at night when protein is eaten before bed. Over 12 weeks, 44 volunteers were asked to lift weights three times a week and drink either a protein drink or a placebo before bed. The results showed that the group who drank the protein drink had significant increases in muscle strength and size. Protein builds muscle and needs to be ingested every day, because unlike sugar and fat, the body does not keep it in reserve. Eating cereal before bed or whey protein before bed can provide the protein needed to help the body create muscle overnight. Another benefit of eating protein before bed is weight loss. A study published in the British Journal of Nutrition showed that a group of college-aged men who consumed whey or casein protein before bed had a higher resting energy expenditure when compared to the placebo group of the same study. Another study showed that casein protein did a better job over whey protein and carbs at keeping test participants fuller overnight and even into the morning, suggesting that consuming casein protein could possibly limit how much food someone eats overall. The study was published in the journal Applied Physiology, Nutrition and Metabolism. Having milk and protein before bed—whether it’s in the form of casein or whey—helps promote the growth of muscle tissue overnight and by extension, strength. This is the number-one benefit to eating protein before bed and is especially important for people who are training and trying to build muscle. Eating protein before bed allows your body to continue building overnight rather than stopping because it has nothing to work with. A great way to get protein into your diet during the day or before bed is to buy whey or casein protein (or both), and add it to a smoothie, some yogurt, or a juice of your liking. One scoop of the powder usually provides up to 12 grams of protein. Look for powdered protein at a drug store, a health food store or a bulk food store, and look for sources with high-protein readings and minimal added ingredients. Don’t worry about flavor—that can come from the food it’s being added to; it’s not required that your protein source has to taste like vanilla or chocolate, for example. Other great sources of lean protein include salmon, tuna, and halibut—they all offer 26 grams of protein per 100 grams. Low-fat or fat-free mozzarella cheese comes in at a whopping 32 grams of protein per the same 100 grams, and chicken—that is, lean parts of the bird like the breast—have 18 grams of protein per 100 grams. Beef is the king of protein at 36 grams of protein per 100 grams, but this is only for lean cuts of beef. Is it good to take protein before bed? Yes. Protein is the building block of the body, and creates muscle. Since protein is not stored in the body it needs to be replenished every day, so consuming a lot of protein is essential to keep a lean body mass that not only looks good but functions properly. Taking protein before bed helps with muscle mass, but there are other optimal times for taking protein, such as first thing in the morning. Great sources of protein in the morning are eggs and oatmeal either alone or paired up for an added protein boost. Before or after a workout are also great times to consume protein. Snijders, T., et al, “Protein Ingestion before Sleep Increases Muscle Mass and Strength Gains during Prolonged Resistance-Type Exercise Training in Healthy Young Men,” Journal of Nutrition, 2015; doi: 10.3945/ jn.114.208371. Ormsbee, M.J., et al, “The influence of nighttime feeding of carbohydrate or protein combined with exercise training on appetite and cardiometabolic risk in young obese women,” Applied Physiology, Nutrition, and Metabolism, 2015; 40(1): 37-45, 10.1139/apnm-2014-0256. “Does Eating Protein Before Bed Help Boost Metabolism?” SF Gate web site; http://healthyeating.sfgate.com/eating-protein-before-bed-boost-metabolism-11258.html, last accessed March 3, 2016. “Protein Before Bed Helps Boost Muscle?” Runner’s World web site; http://www.runnersworld.com/sweat-science/protein-before-bed-builds-muscle, last accessed March 3, 2016. “The Top 10 High-Protein Foods – Clear and Detailed Information for Your Best Protein Sources,” HealthAliciousNess web site; https://www.healthaliciousness.com/articles/foods-highest-in-protein.php, last accessed March 3, 2016.